Arriving on an overnight flight, I literally had a whole day to explore London. 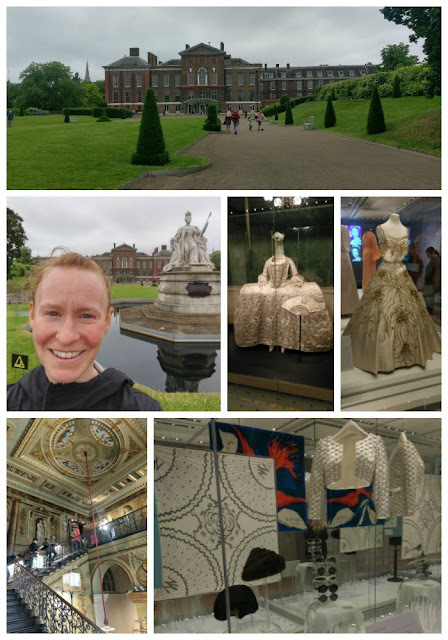 I took the Heathrow Express train to my stop at Paddington Station, dropped my bags at my hotel and headed out for some breakfast (not pictured) and then to Kensington Gardens and Palace. 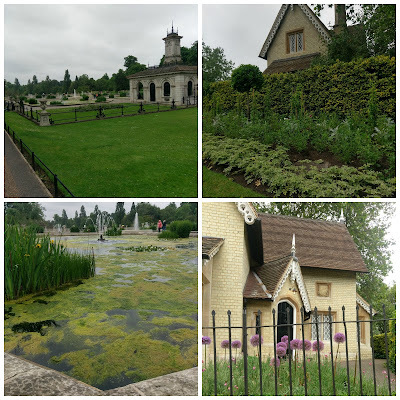 Although it was raining - and will be all week - I had a great walk and saw some beautiful fountains, buildings and plants. The palace was amazing. They had dashed lines along the walls to take you on four different paths - the King's apartment, the Queen's closet over the years, the life of Queen Victoria and the Queen's quarters. I took a selfie of Queen Victoria and I outside the castle. The dresses and accessories pictured were worn by different queens and princesses. The stairway is the entrance to the King's apartment. 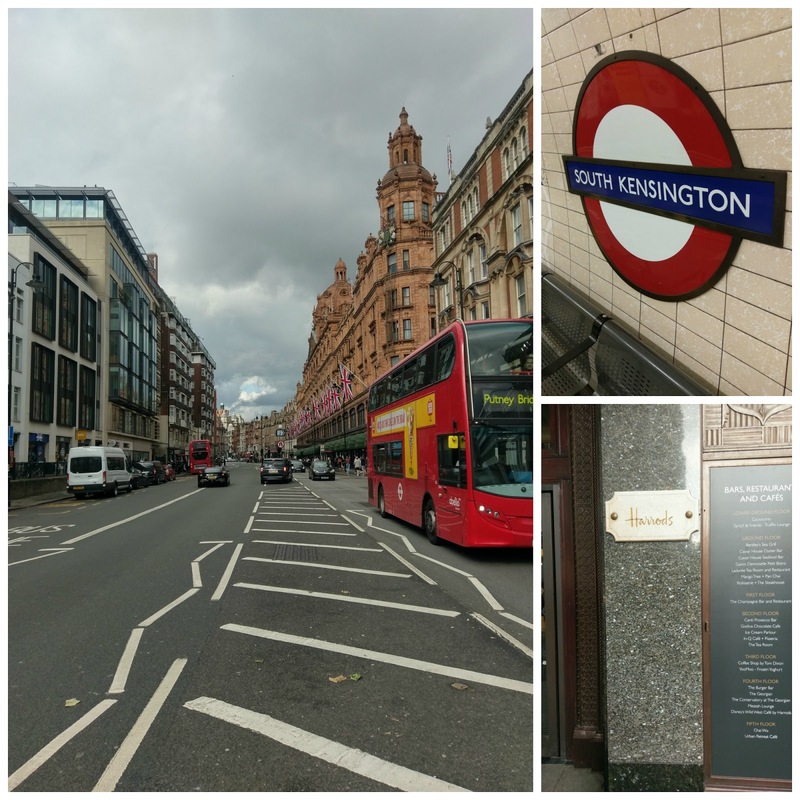 After walking about 10 miles, I was starting to tucker out and had to navigate the tube. I already have public transportation anxiety (I know, it's dumb), and being up for most of 36 hours had me feeling victorious when I actually arrived near Harrods, which included a line switch - woohoo! The photo down the street has Harrods on the right with all of the British flags. Wandering through the iconic store was also like a museum. The store houses all of the items you see in magazines along with the caption, "price available upon request." Every high end designer had it's own little shrine and people were buying like crazy. I just looked. 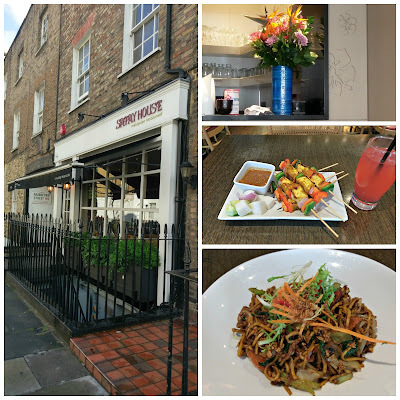 After checking into my room, and fully unpacking (since I'll be here for six nights), I relaxed for a bit and made a dinner reservation for Satay House, which seemed silly at first but the place was rather small and packed, they turned away two other single diners. A short walk from my hotel, this Malaysian restaurant was a hit for me. The decor was primarily flower impressions in the walls and a bouquet of beautiful flowers next to the kitchen. I had a Sirap Limau (rose syrup and fresh lime juice), the vegetarian satay and the Mee Goreng Sayur. Everything was delicious and I ate until I was stuffed and headed back to the hotel. Time for sleep, thanks for stopping in! London is on my bucket list. Looking forward to your posts. It's been on my list forever too - excited to be here and share what I find!